There are a number of reasons the flu is worse than normal this year. 1. The flu vaccine is only 25% effective. 2. Multiple strains of the flu are circulating at the same time. 3. H3N2, a prevalent strain of Influenza A, can cause some peoples’ immune systems to go into overdrive causing more inflammation, which makes them sicker. If your family has experienced the flu this season, it’s important to clean your home to prevent the spread of the virus. While disinfecting your entire house can be overwhelming, experts recommend focusing on frequently touched items or surfaces. When it comes to disinfectants, there are many options. You can buy products such as Lysol spray or Clorox disinfectant wipes. Make sure to read the product’s label before buying. 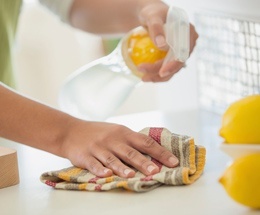 Other home remedy cleaning solutions may work just as well. Here’s a list of common household items you should disinfect in your home. 1. Mobile device(s). Whether we admit it or not, we spend countless hours on our mobile devices. It’s estimated that in the U.S., people spend up to five hours per day on their mobile devices. Since cold and flu viruses can live on them for a few days, it’s important to clean them regularly. 2. Computer keyboards. If your child is home from school sick, but is doing schoolwork on your family computer, it’s a good idea to clean it after each use. 3. TV remotes/video game controllers. TV remotes and video game controllers are used quite frequently, but are probably never cleaned. An ill family member may use them to pass time. 4. Doorknobs, handrails, and faucets. These items are common touch points in our homes. Germs live the longest on hard surfaces. 5. Kitchen and bathroom countertops. These countertops are used frequently and may contain the most germs in your home. Use disinfectant wipes or paper towel in combination with a spray. Don’t use a sponge because germs can live inside it. 6. Children’s toys. If you have small children, everything tends to go in their mouths. Clean their toys daily with warm soapy water and dry them using paper towel. Here’s a list of additional precautions you can take to prevent the spread of the flu virus. 1. Toss the toothbrush. If you have a cheap toothbrush, throw it away. If it’s your favorite toothbrush and you don’t want to part with it, look online for ways to disinfect it. 2. Use disposable towels. Hectic schedules during the week can make it difficult to keep up with laundry. Using disposable towels cuts down on laundry and prevents the spread of germs from sharing towels. 4. Wash your hands frequently. Wash your hands frequently with soap and water for at least 20 seconds. Alternatively, use an alcohol based hand sanitizer that contains at least 60% alcohol.